Perfect for your stylish living room, this modern cocktail table has it all. The glass top and glass shelf are beautifully accented by the Black Nickle finish of the legs. 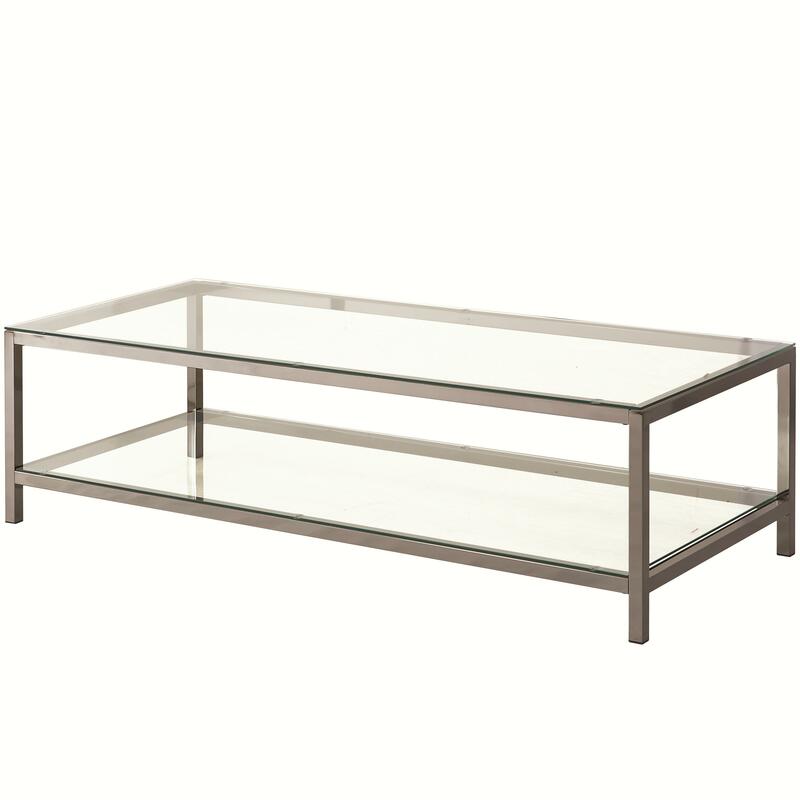 Create a handsome contemporary space in your living room with this stunning cocktail table. The 72022 Cocktail Table with Shelf by Coaster at Al-Mart Furniture in the Oak Park, River Forest, Chicago, Elmwood Park, Forest Park, River Grove, Maywood, Melrose Park, Berwyn, Cicero, North Riverside, Brookfield, Lagrange Park, Franklin Park, Norridge, Oakbrook, Elmhurst, Bensenville, Lyons, Stickney, Harwood Heights, IL area. Product availability may vary. Contact us for the most current availability on this product. Contemporary styling will fill your living room with the addition of this 72022 occasional table collection. Shelves and tops made of glass give this collection the perfect modern look and the ideal place for your to display your valuables. Accented by Black Nickel finished legs, this collection will add all the modern grace and style you have been craving to your living room. 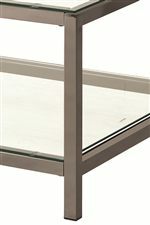 The 72022 collection is a great option if you are looking for Contemporary furniture in the Oak Park, River Forest, Chicago, Elmwood Park, Forest Park, River Grove, Maywood, Melrose Park, Berwyn, Cicero, North Riverside, Brookfield, Lagrange Park, Franklin Park, Norridge, Oakbrook, Elmhurst, Bensenville, Lyons, Stickney, Harwood Heights, IL area. Browse other items in the 72022 collection from Al-Mart Furniture in the Oak Park, River Forest, Chicago, Elmwood Park, Forest Park, River Grove, Maywood, Melrose Park, Berwyn, Cicero, North Riverside, Brookfield, Lagrange Park, Franklin Park, Norridge, Oakbrook, Elmhurst, Bensenville, Lyons, Stickney, Harwood Heights, IL area.